My friend Elizabeth posted this amazing photo of the blue moon over Austin Texas where she lives. Nice to think that she and I were looking at that same beautiful moon even though we were thousands of miles apart. And our friend Mitch captured the blue moon over Jessica Lake where he owns a cottage. Winnipeggers know how to party hearty that’s for sure! We live in the Exchange District and it wasn’t easy to get to sleep last night what with the horns honking and the people shouting. The corner of Portage and Main lines up almost directly with our front door so we were treated to some of the noise and hoopla of enthusiastic Winnipeg Jets fans celebrating the fact that their home team had made it to the playoffs. Click the logo below to see some video coverage of the festivities from Global News. I’m thinking that if the Jets win the Stanley Cup we might have to book into a hotel in another part of the city for the night. Last week I was biking down Sherbrook Street and discovered the brand new bike lane. It’s great! Cyclists are completely separated from traffic and don’t have to wend their away around parked cars. I read that cycling lobbyists have been pushing for construction of this bike lane since 2010. My hat is off to them. I feel completely safe cycling down Sherbrook now. I did read some negative comments from motorists who feel the bike lane is causing traffic to pile up on Sherbrook. Since apparently in summer up to 2,500 people a day bike down Sherbrook, perhaps some of the motorists want to leave their cars at home and join the bikers if they don’t like getting caught in traffic. I have empathy for those who may be scared to cycle in the city. That was me when we first moved to Winnipeg. But I’ve discovered there are safe routes to take, most drivers are courteous and kind to bikers, and biking has been such a great way to see the city and learn to navigate my way around it. Apparently Sherbrook is the first parking protected bike lane in Winnipeg. Hopefully there are many more to come. 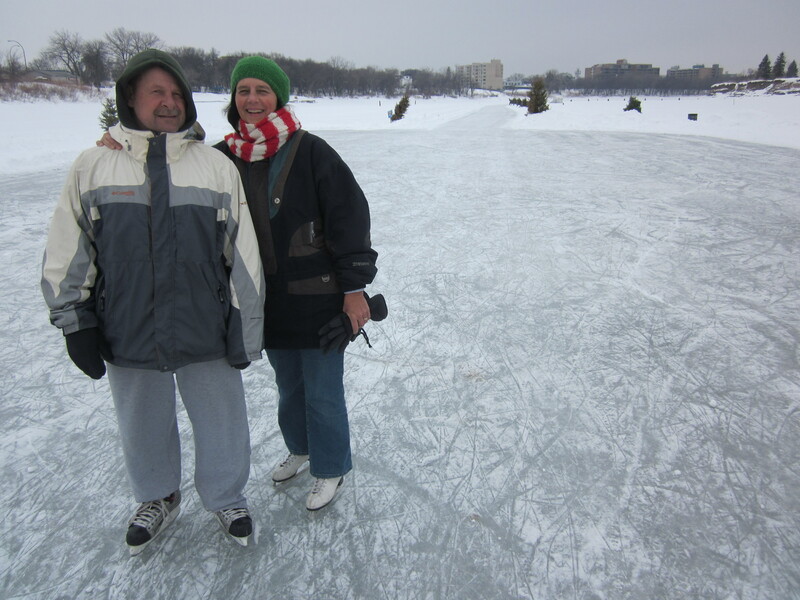 Other posts about being active in Winnipeg……. My husband and I watched the Winnipeg Jets play the Minnesota Wild in their second last home game of the season. Read all about it on my What Next blog. 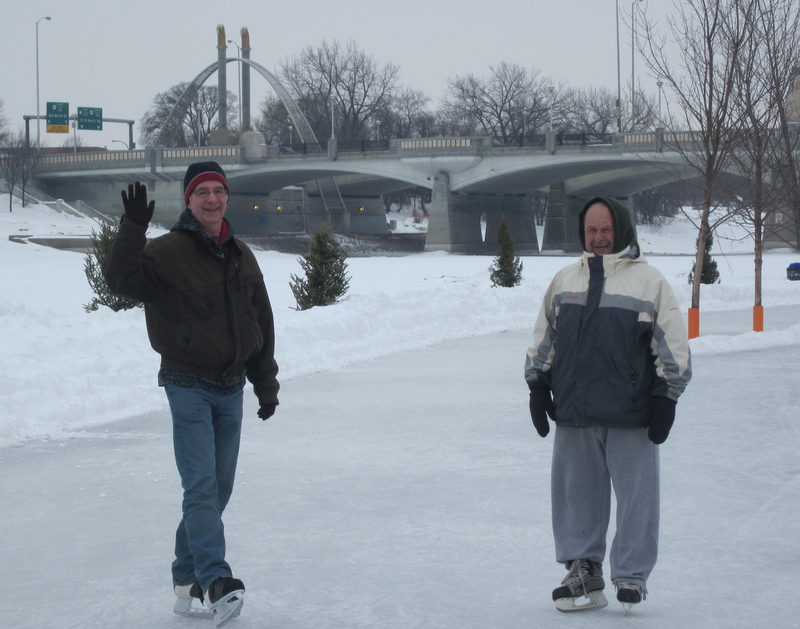 This morning Dave and I skated down the Red River. During years when there are optimal weather conditions this icy path is the longest skating rink in the world. The path starts at The Forks where the Red and Assiniboine rivers meet. 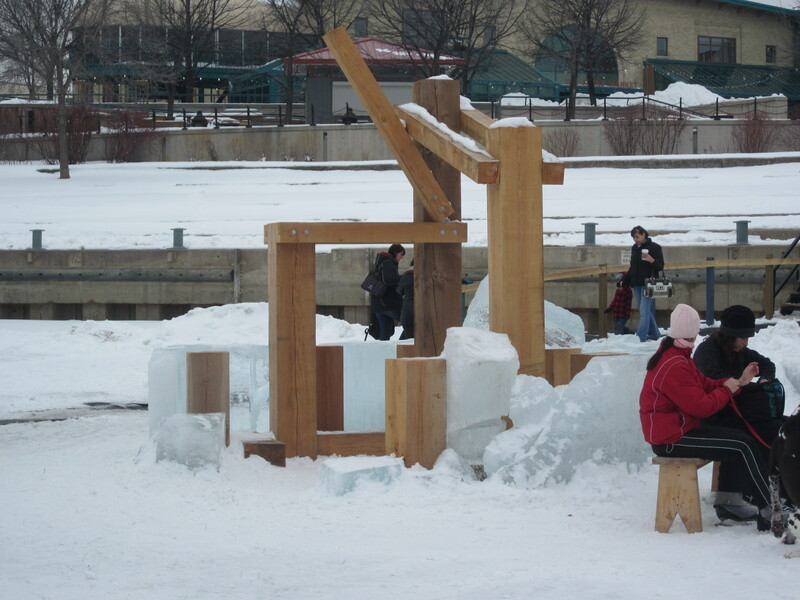 Traders, First Nations people, settlers and hunters have been meeting at The Forks for 6000 years. We met our friend Les at The Forks. He has skated this river pathway many times and was our guide. 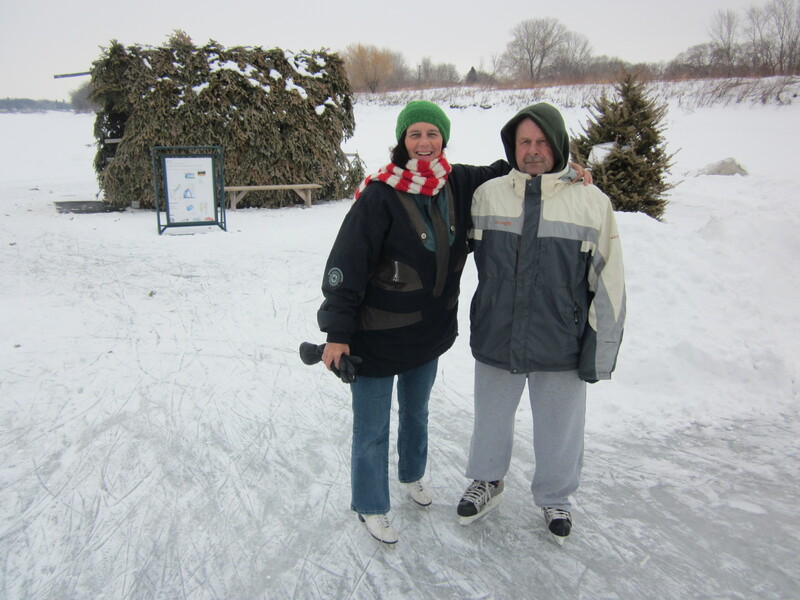 Les normally skates this route at a much faster pace but he was patient with me. 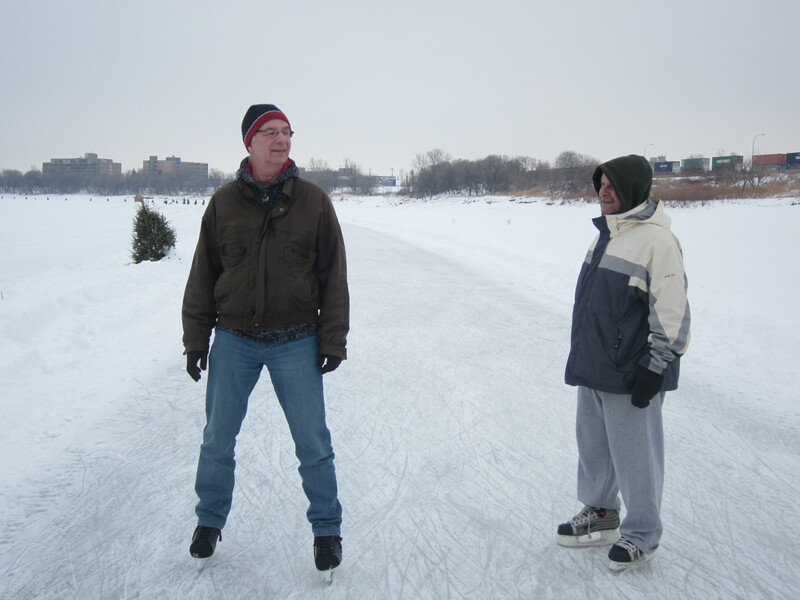 I hadn’t skated in over a decade and my old skates–still from my high school days– were a little tight and pinched my feet. I was nervous about falling because with our warming weather conditions the ice has quite a few cracks, potholes and bumps. However I managed to stay upright traveling both ways along the river. 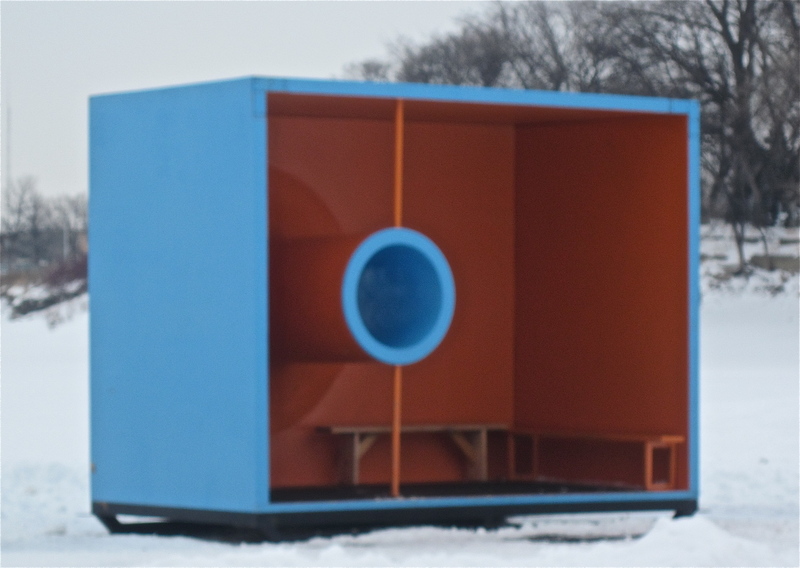 One of the interesting things about skating down the Red River is checking out all the unique warming huts along the route where skaters can stop to rest, get out of the wind or re-lace their skates. These huts are the result of an annual international competition which has had up to 140 entries. This hut is called Wind Catcher and was designed by Tina Soli and Luca Roncoroni from Norway. 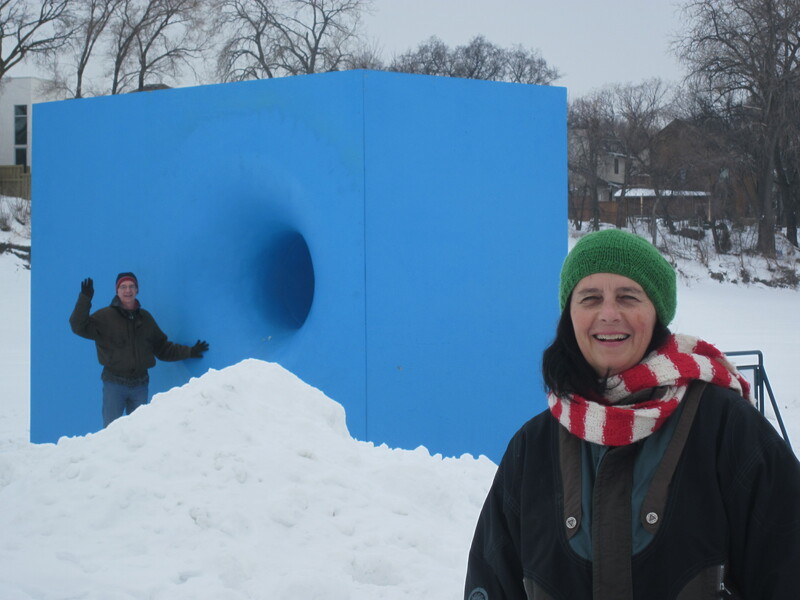 The designers said they wanted to create a kind of ‘hole in the wall’ piece that inspired curiosity with strong bright colors that contrasted with the white winter background. 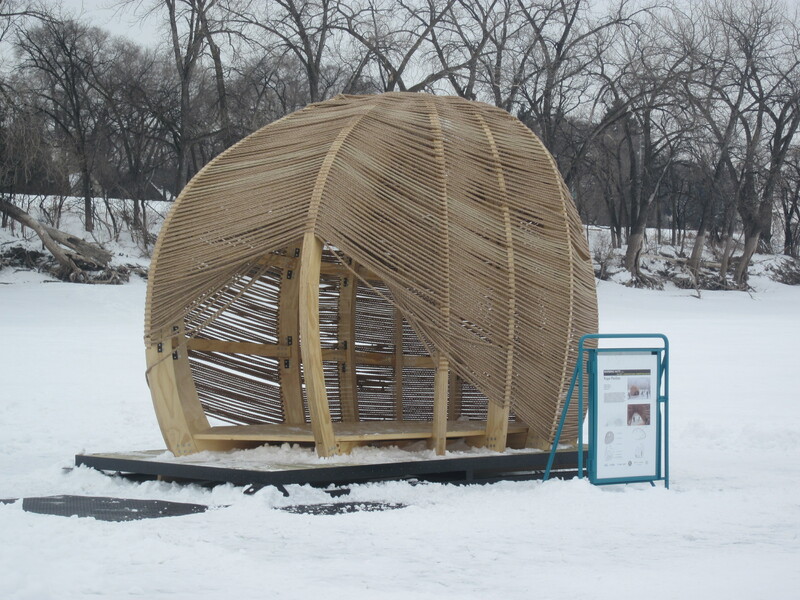 This hut was created by a quartet of designers from New York and is called Rope Pavilion. It has a birchwood frame and is woven with manila rope. 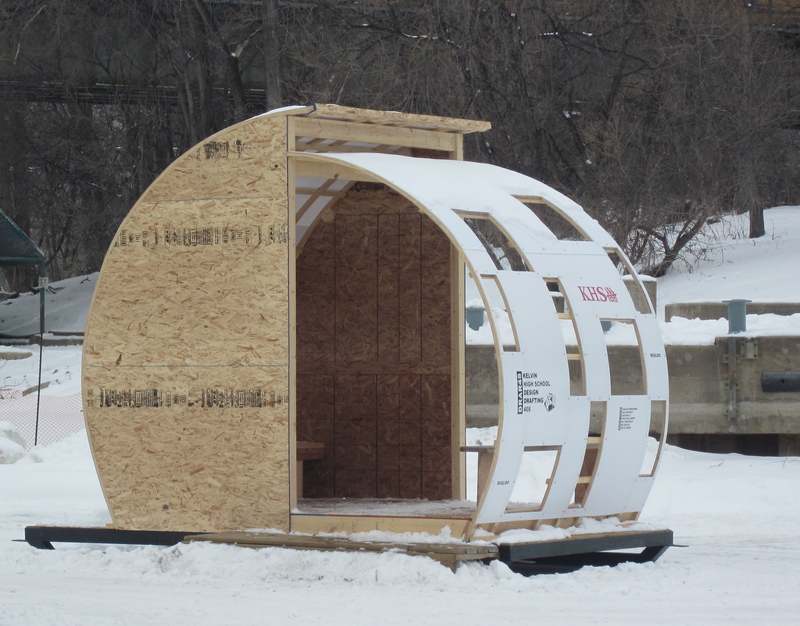 Here’s a uniquely shaped structure called Hot Hut created by students from the University of Manitoba. 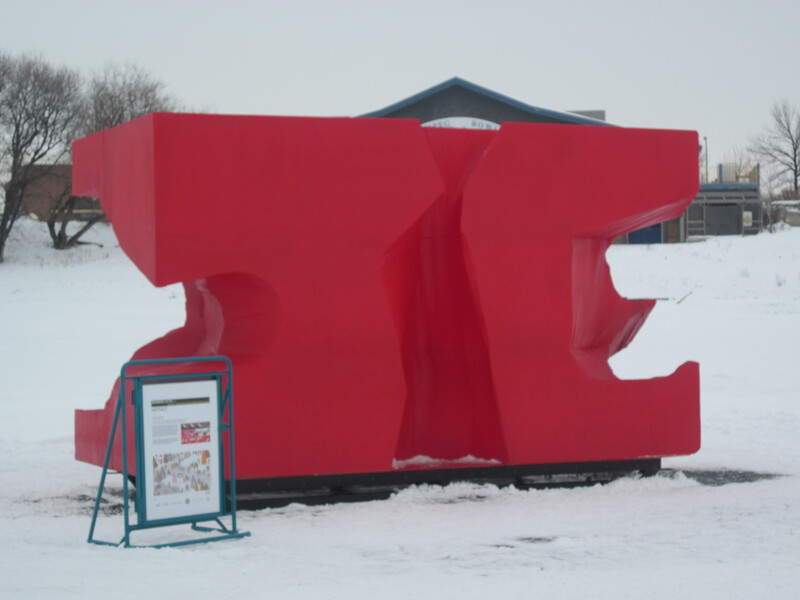 It is made of high density foam. Fir Hut was designed by Richard Kroeker. He was inspired by aboriginal designs and techniques. The Mi’kmaq people of Atlantic Canada taught Richard the art of thatching balsam fir. Five Hole was the name of this hut, the main attraction of the river ice path this year but unfortunately all that is left is the frame since it was made of ice blocks and the weather has been so warm most have melted. A photo of the hut appeared in a Macleans magazine article. It was designed by the Gehry Design firm from Los Angeles and was made to look like an abstract igloo. Gehry Design was founded by Frank Gehry the famous architect who designed the Guggenheim Museum. This hut looked like it was covered in aluminum foil. 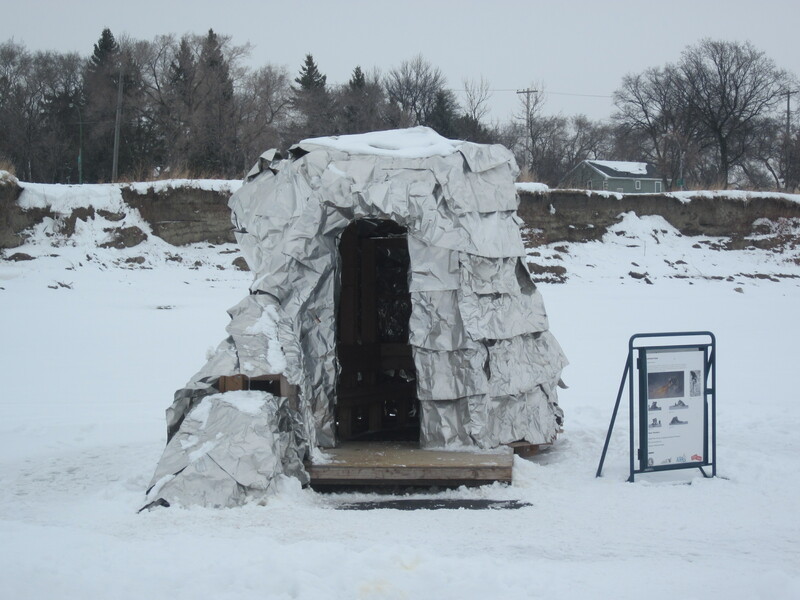 Twelve students from Kelvin High School’s design drafting course created this hut. 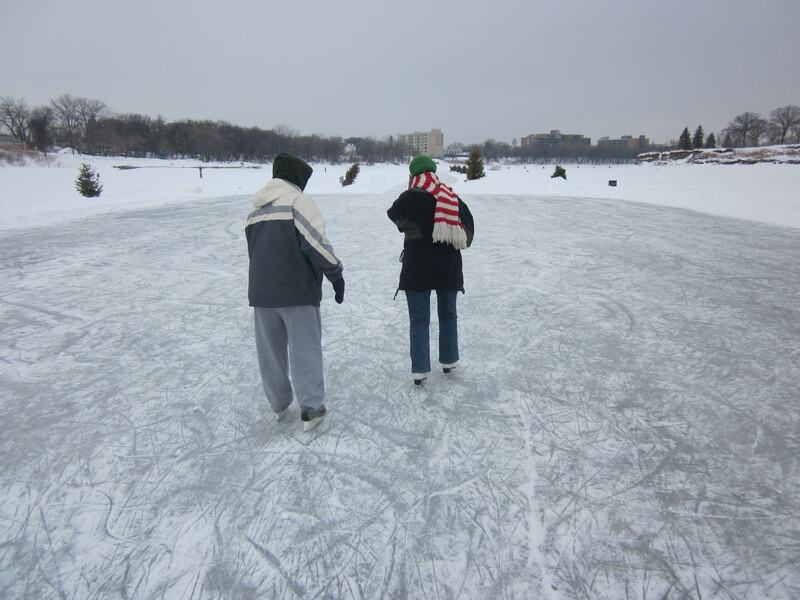 It was a balmy winter morning today just right for a river skate adventure. A little sunshine would have made it even nicer. I really enjoyed my skate although I think new blades may be in order before I try the route again. Check out this very entertaining video excerpt from Rick Mercer’s show about skating at The Forks. I went to my first Winnipeg Jets game tonight at the MTS Centre. The Jets were playing the Buffalo Sabres. It was certainly a unique experience to be part of the hockey crazy crowd. Winnipeg is known for having the loudest, most passionate fans in the National Hockey League. It isn’t easy to get a ticket to see the Jets. The games are sold out for the next three years, but we were fortunate enough to be at the MTS Centre as the guest of Buffalo Sabre player Robyn Regehr, number 24 in this photo. We received the tickets from Robyn through a family connection. I felt badly that the Buffalo Sabres lost the game, since Robyn had been kind enough to get us tickets. But it sure was exciting to see the crowd go wild when the Jets scored their three goals. Buffalo only scored one. Our seats were excellent and I really felt like I was part of the action on the ice. The game went by very quickly. They show all kinds of special features on the huge screen above the ice between periods. I enjoyed one about two Winnipeg Jets going to a public school to read books to kids during I Love To Read week and another where forward Jim Slater goes to work with a French horn player from the Winnipeg Symphony Orchestra and gets a chance to conduct the orchestra. 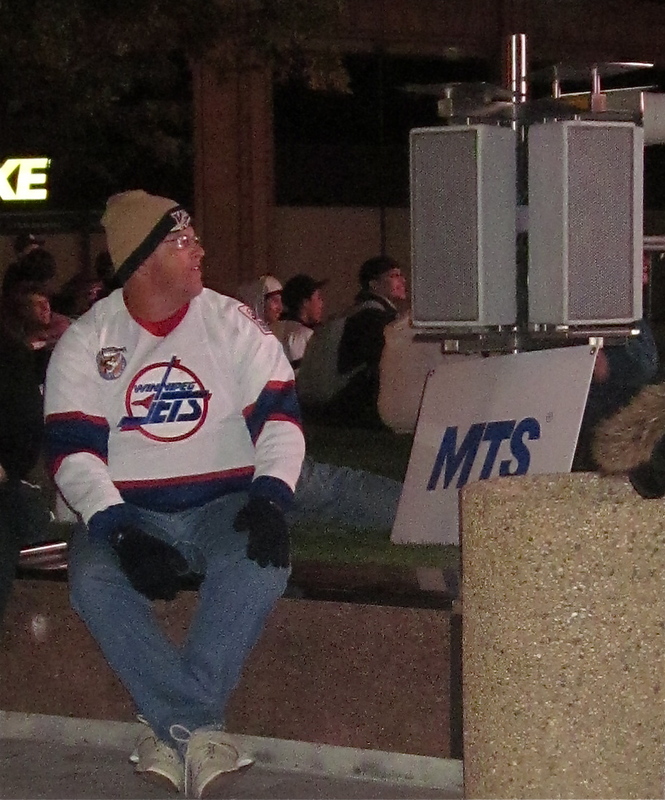 The crowd applauded long and loud when the screen revealed that former Winnipeg Jet Dale Hawerchuk was in the stands. I was glad Dave was at the game with me to explain things like….. the reason the crowd shouts out the words TRUE NORTH during the singing of Canada’s national anthem. This is because the True North corporation owns the Winnipeg Jets. At one point during the game everyone was chanting GST. In Canada this stands for Goods and Services Tax but at a Jets’ game it refers to three players Glass, Slater and Thorburn who form a powerful goal scoring line for the team. After Winnipeg scored a goal the crowd was shouting in a sing-song sort of way MILLER over and over. Dave explained Miller was the name of the Sabres goalie and the fans were taunting him for letting in a Jets’ goal. Well known fan Dancing Gabe was there and that was one thing Dave didn’t have to explain. 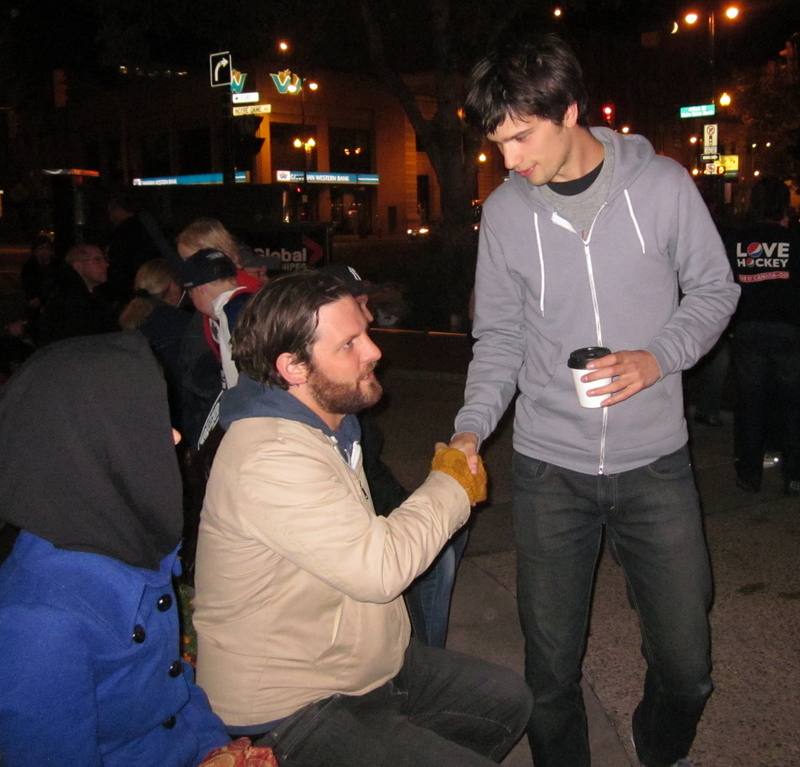 I’d met Gabe when I went to the premiere of a movie about the Jets called White Noise. Our son wrote and performed the music for the movie. The Jets are the ‘talk of the town’ in Winnipeg. I’m glad I got to experience Jets’ mania for one evening. Thanks Robyn and Ben and Marlie too for arranging it. 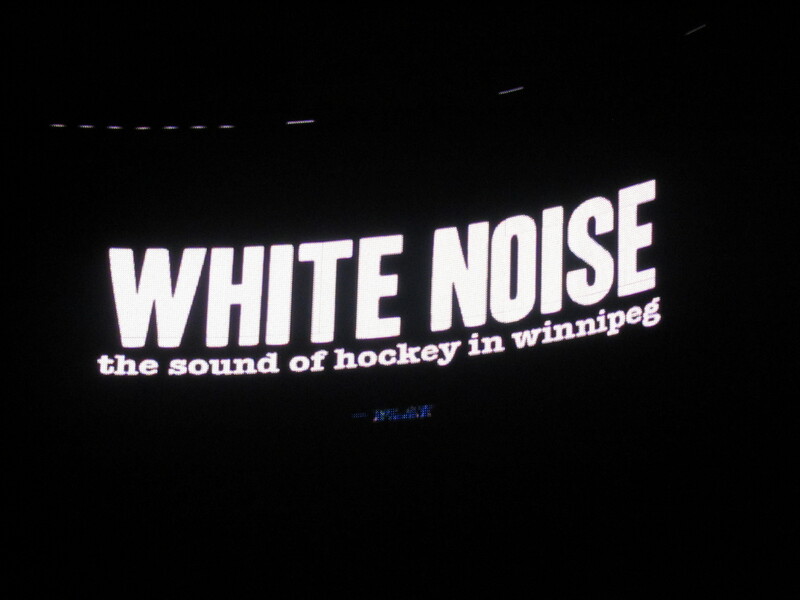 Saturday night we went to the premiere of a new movie about the Winnipeg Jets called White Noise. The movie directed by Randy Frykas was being shown on a 35 foot screen at the corner of Portage Avenue and Main Street. They were handing out huge foam mitts to advertise the film and Dave put one on to pose for this picture. The movie premiere was outdoors and it was chilly so we had to dress warmly for the event. We had a special interest in the movie because our son Bucky composed the score for the sound track with Matt Schellenberg his partner in the musical group The Liptonians. Some songs from their second album Lets All March Back Into the Sea were also featured. Here Bucky greets Tyler Funk the director of photography for the movie. The film isn’t so much a history of the Winnipeg Jets but rather focuses on the relationship between the people of Winnipeg and the team before, during and after the franchise’s move to Phoenix in 1996. It also documents the response of Winnipeggers to the announcement that their city would be the home of an NHL team for the 2011-2012 hockey season. The name of the movie comes from the fact that when the old Winnipeg Jets were in the play offs, the fans virtually all wore white shirts to games, and the Winnipeg arena would be a sea of white noisy fans. 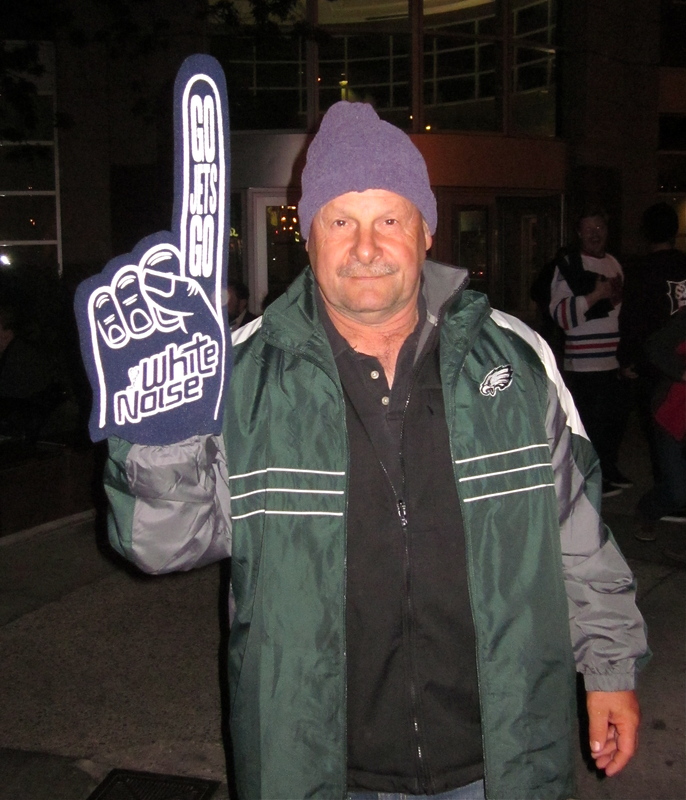 The movie features interviews with former Jets players, local sports reporters, broadcasters and die-hard fans like Darren Ford who maintained a website devoted to getting the Jets back in Winnipeg for 15 years. 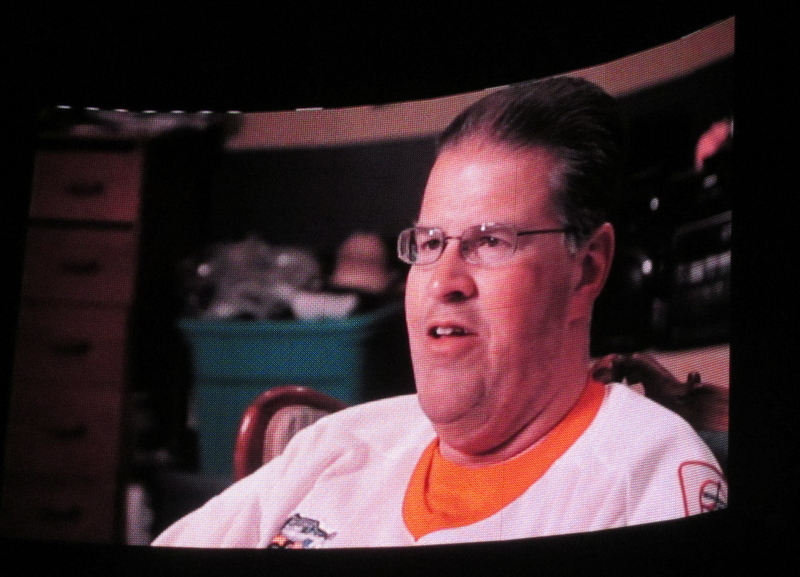 The movie also featured a Winnipeg man whose entire basement is filled with Jets’ memorabilia and Dancing Gabe, pictured in the screen shot above. Dancing Gabe is a regular at all Winnipeg sporting events, acting as an enthusiastic cheerleader for the audience. Dancing Gabe was at the premiere on Saturday night and went up on stage at the end of the 45 minute movie to be acknowledged. We went early to get front row seats for the premiere. Bucky’s fiancée Alisa and her brother Jonathan were with us as well. There was a good-sized crowd out for the movie debut. We were very proud of Bucky. He and his band put lots of time and hard work into creating and performing the film’s music. You can view a trailer for the movie or watch it for free on Winnipeg’s MTS Video on Demand. 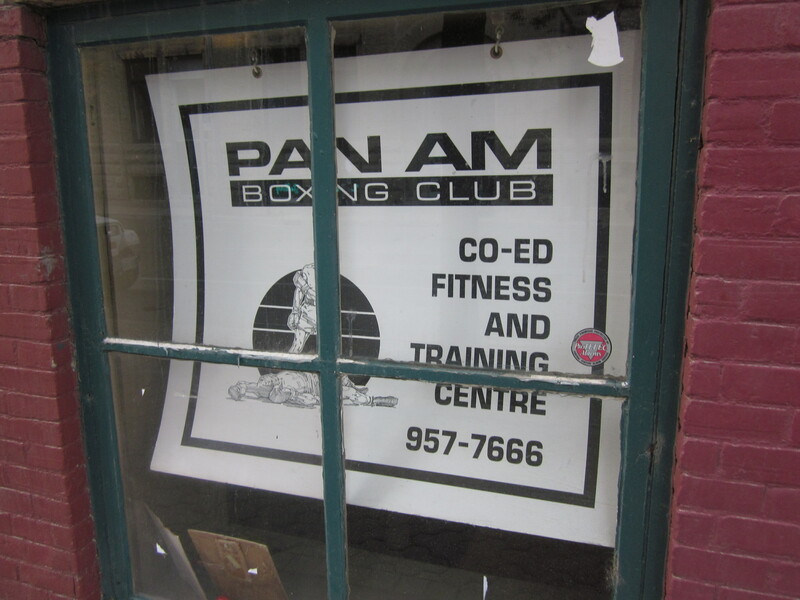 Dave and I have gone by the Pan Am Boxing Club several times on our walks in our neighborhood. The club which was founded just after Manitoba hosted the Pan Am Games in 1967 is a real community player. 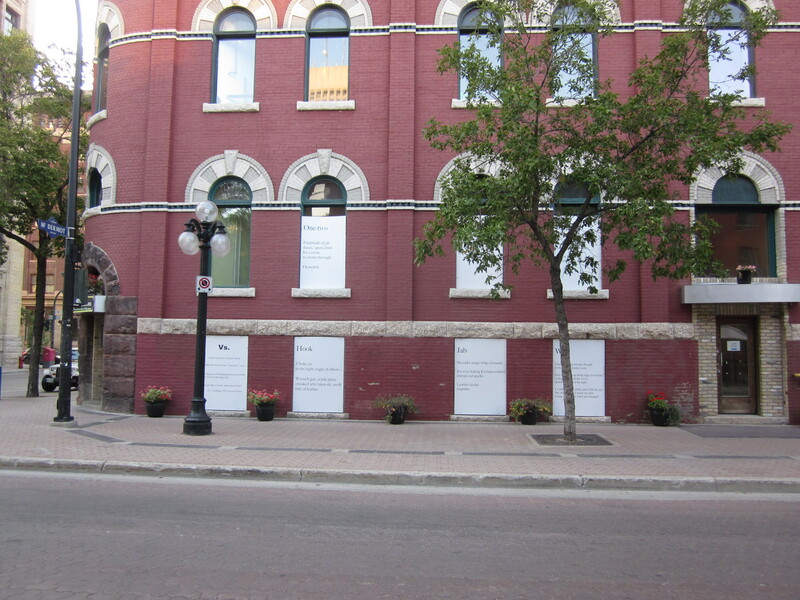 They are in the process of developing the building next door as living quarters for at risk youth in downtown Winnipeg who want to make a change in their lives. The young people who participate will be involved in a program that includes fitness, education and volunteerism. 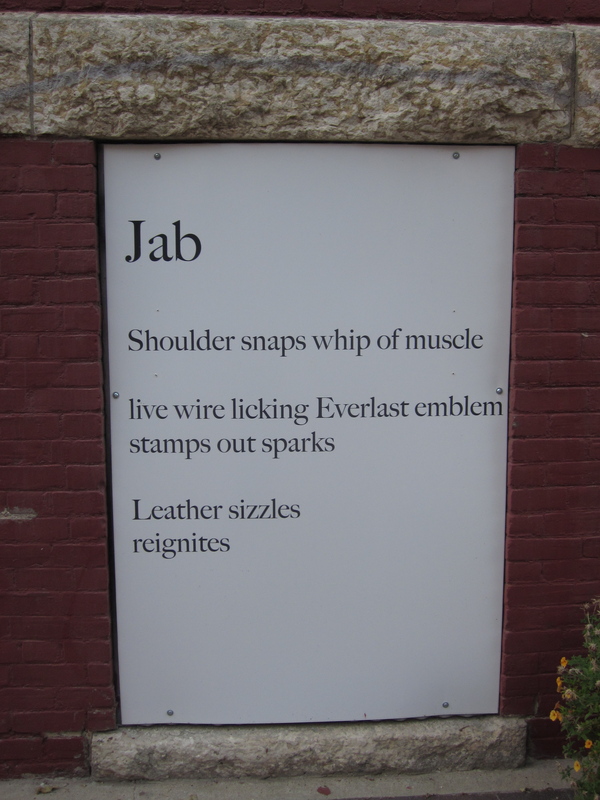 The Pan Am Boxing Club is located in this beautiful old building on McDermot Avenue. 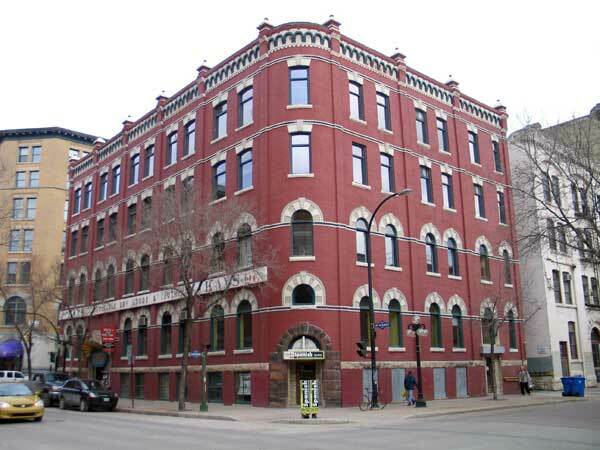 I did a little research and found out it was built in 1893 and the top two floors were added a few years later. 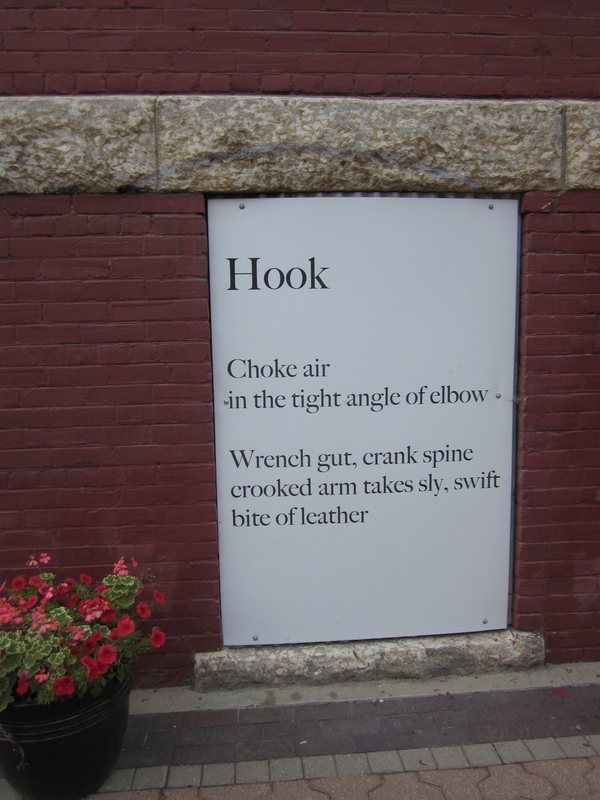 It was designed by Hugh McCowan and was home to the Stovel Printing and Publishing Company. A German newspaper called Der Nordwestern also had its editorial offices in the building. It is an official historic site of Manitoba. In the 1940’s a dry goods firm bought the building. 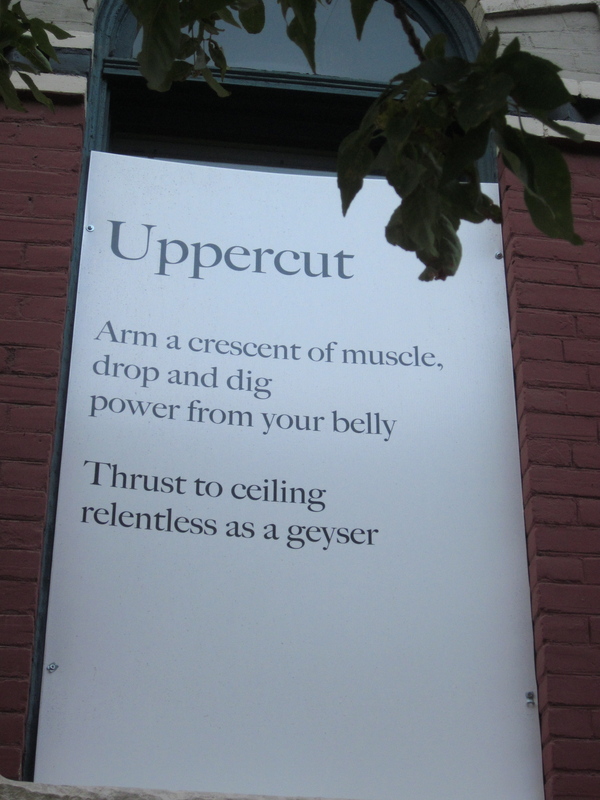 What I hadn’t noticed till I walked by the building on Saturday night was that the one side of it features the verses of a poem, a poem about boxing. 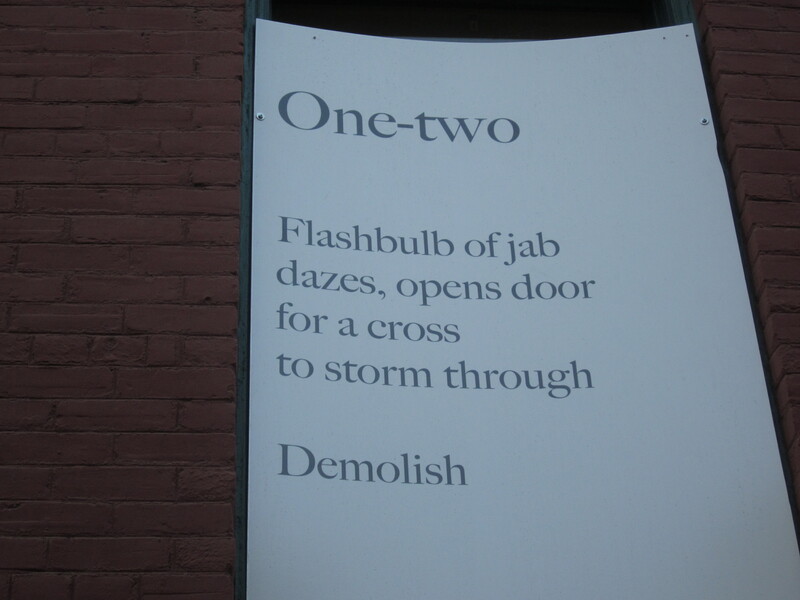 The verses of the poem are tucked into window frames on the first two stories. 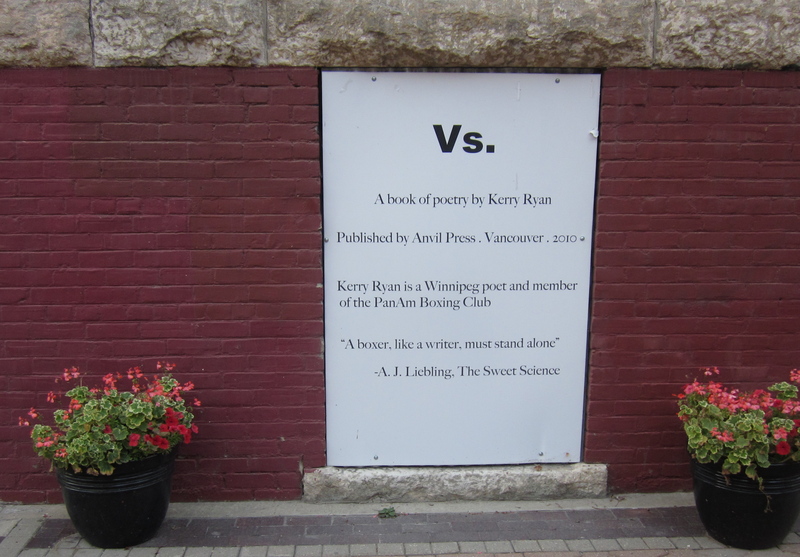 The poem comes from a book called VS. Kerry Ryan the poet is described as a shy, bookish woman who decided to take up boxing for the physical and mental challenge and became enamored with the sport as well as with the people at the PanAm Boxing Club. 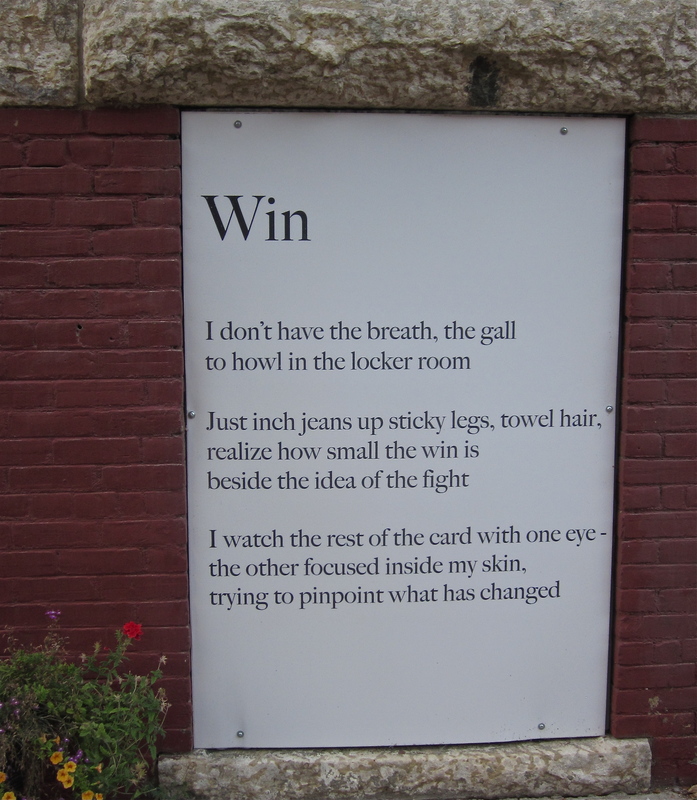 She wrote a book of poems about her boxing experiences which is available at McNally Robinson here in Winnipeg. END NOTE : Kerry Ryan the poet saw this blog post and sent me a free copy of her poetry book.